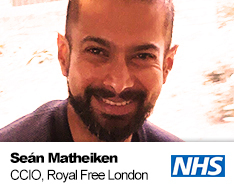 Sean Matheiken is a Consultant Vascular Surgeon and Information Technology Entrepreneur. He lives and works between London and Manchester. Sean has designed and developed novel mobile solutions for modern day clinical conundrums with an emphasis on ergonomy and interoperability. He continues to try and get people to take him seriously, to not much avail.